The previous article in this series analyzed the first part of Geert Wilders speech to the Hudson Institute in New York on September 25, 2008. In his article, Mr. Wilders' warns that his native Netherlands and Europe overall is being taken over by Islamic immigration. As a call of alarm, he created a short documentary called Fitna, using just the Koran, news stories and Islam's own practices to make people aware of what living under Islam would be like. 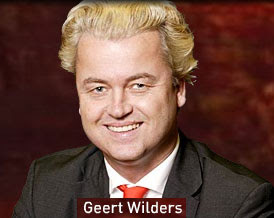 Mr. Wilders' speech is full of references that Bible prophecy students can recognize. The second part of his speech will be analyzed here. For the full speech text, visit the People's Party for Freedom and Democracy website. "Our many problems with Islam cannot be explained by poverty, repression or the European colonial past, as the Left claims. Nor does it have anything to do with Palestinians or American troops in Iraq. The problem is Islam itself. This is what you need to know about Islam, in order to understand what is going on in Europe. For millions of Muslims the Quran and the life of Mohammed are not 14 centuries old, but are an everyday reality, an ideal, that guide every aspect of their lives. Now you know why Winston Churchill called Islam 'the most retrograde force in the world', and why he compared Mein Kampf to the Quran." The generations since World War II in the Western world haven't had to deal with a totalitarian ideology like Islam, and so doesn't understand its mentality. Whether people "get it" because they understand Islam and its bloody history, or not because of their multicultural all-embracing ideology and/or ignorance of Islam's agenda, much of the Western free world still lives in great fear of Islamic takeover. History proves the latter's response cannot possibly succeed, though. Islam uses the open-arms-embracing multiculturalism to get its foot in the door and then implements its strategy for takeover. The latter's embracing mentality always results in its own conquest due to the sheer forcefulness of the totalitarian mindset. Islam cannot then press forward with world conquest as its strength based in the Middle East will be lost due to those crushing defeats occuring before the Tribulation begins. Islam will have experienced a defeat so overwhelming and so humiliating that the eyes of millions of Muslims will be opened to the fact that Allah is a false god. At that point their hearts will be opened to the true God — a God of loving kindness who came to this earth and died for the sins of mankind. With Islam disillusioned and Christianity raptured, only Judaism will stand as the major opponent to the Antichrist and his own personal religion during the Tribulation.